My research focuses on richer tools for designing three-dimensional objects, particularly by novice and casual users, and on related problems in 3D synthesis and reconstruction. This research is driven by a more abstract interest in shape understanding at both the structural and semantic levels. (Why is a model of a chair not one of a chicken? What distinguishes a well-designed chair from a badly designed one? How can one build a better chair?) By building computational models of form, attribute and function, we develop new techniques for designing shapes (e.g. for 3D printing or architecture), for recognizing and reconstructing objects (e.g. in scanned cities or indoor environments), and for analysing large collections of three-dimensional data such as the 3D Warehouse. I also like rendering scenes with many billions of polygons in real time. I'm spending a year as a lecturer in the Computer Science department at Cornell University. In Fall 2015, I will join IIT Bombay as an Assistant Professor. I was previously a postdoc at Princeton University, working with Tom Funkhouser. I received my PhD from Stanford University in 2011, supervised by Vladlen Koltun. [Apr 2015] Our paper on semantic shape editing with deformation handles (a continuous-deformation counterpart to our UIST 2013 paper) was accepted to SIGGRAPH 2015. [Dec 2014] I will be co-teaching a one-day course on "Data-Driven Visual Computing" at SIGGRAPH Asia 2014 in Shenzhen, with Leo Guibas, Alyosha Efros, Shi-Min Hu, Arik Shamir, Kevin Xu and Jun-Yan Zhu. [Nov 2014] AttribIt was covered in Princeton's Discovery research magazine. "Fierce, Fiercer, Fiercest: Software enables rapid creations -- A new software program makes it easy for novices to create computer-based 3-D models using simple instructions such as 'make it look scarier'." [Aug 2014] Our paper on hierarchical analysis of 3D scenes was conditionally accepted to SIGGRAPH Asia 2014. [Jun 2014] Fuse 1.1 supports adjustment shapes, for freeform deformation of body parts. See the video. [Apr 2014] Our paper on human-centric shape analysis was accepted to SIGGRAPH 2014. Siddhartha Chaudhuri and Vladlen Koltun, "Data-Driven Suggestions for Creativity Support in 3D Modeling", ACM Transactions on Graphics 29(6) (Proc. SIGGRAPH Asia), 2010. 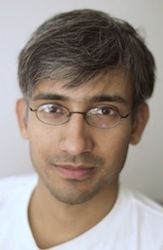 Siddhartha Chaudhuri and Vladlen Koltun, "Smoothed Analysis of Probabilistic Roadmaps", Computational Geometry: Theory and Applications 42(8), pp. 731-747, 2009. Siddhartha Chaudhuri, Randhir K. Singh and Edoardo Charbon, "Feature-Based Techniques for Real-Time Morphable Model Facial Image Analysis", Image and Video Communications and Processing Conference, IS&T/SPIE's 17th Annual Symposium on Electronic Imaging Science and Technology, San Jose, 2005. Siddhartha Chaudhuri, Ratan K. Ghosh and Sajal K. Das, "Towards Optimal Sensor Placement with Hypercube Cutting Planes", IEEE Wireless Communications and Networking Conference, New Orleans, 2005 (invited paper). catalog: Quickly generates a very basic HTML catalog, with track durations, for folks who organize their mp3's as Artist/Album/Track.mp3 (e.g. iTunes). Navigate to root directory of collection and run "catalog > output.html". Uses filename instead of ID3 tag for tracks (I get a lot of unpublished music without ID3s). Requires Perl. James Milne's tips for mathematics authors.